I will do my best to describe both of my terms as clearly as possible. I would describe true randomness as a process that has absolutely no predictability : even if you knew absolutely everything you still would not be able to predict the outcome of said process... i.e. a completely non deterministic process. You could think of it as the current view of quantum mechanics, but assuming there is absolutely no hidden variables that caused that randomness. And I would define truth as a logical truth that will never change and cannot be disproven as long as the same rules of logic are applied. I think the best example my small brain can come up with is assuming we both agree on the same rules of math... 1+1 will always equal 2. If true randomness exists how is it possible for logic and truth to exist? Don't we rest all logic on a fixed axiom? If there is true randomness isn't it possible for that axiom to have no real causall foundation and is thus subject to change? I'm not a philosopher, so if I have not clearly stated something, please let me know, and I'll update with more clarity. Your definition of randomness is not bad. Randomness refers to physical processes only. Mathematical identities like 1 + 1 = 2 are independent of any physical property or process and would be true even if the physical universe were to disappear. The debate over determinism is centered about whether the entire universe is deterministic; if it is, then determinism is true; if it is not, then determinism is false. For determinism be false, there only needs to be some nondeterministic process out there. We don't need to go so far as to claim everything is random—and we definitely don't want to start positing the instability of mathematical truths! If everything were objectively random then everything would denotable in a language, L1; but the meta-language L2 statement about all denotations in L1, 'Everything is objectively random', would true. If we keep to L1, e.g. current English, then if only some things, XYZ, were objectively random we could make the true statement that XYZ are objectively random. And for the remaining class of things that are not objectively random, there is no problem (in principle) in making true statements about them : 'Chlorine has atomic weight 35.453', 'The moon orbits the earth', &c.
Just because a system is random does not mean it is without constraints. For example in quantum mechanics a particle will not necessarily go any particular direction, but it will go less than the speed of light so we can say with certainty that it will be within a certain sphere of area. That is a truth we can say. (assuming we had certainty about the rules governing it, which must be assumed for any certainty regardless of the state of randomness or determinism). As long as there are constraints on the system there is at least something we can be sure about, even if it's just the probability of a certain outcome. Random outcomes are described in terms of completely determined numbers without contradiction. I would describe true randomness as a process that has absolutely no predictability .... And I would define truth as a logical truth that will never change and cannot be disproven as long as the same rules of logic are applied....If true randomness exists how is it possible for logic and truth to exist? It seems that you have begun with two mutually contradictory premises: no predictability versus absolute predictability. No, these cannot be reconciled, assuming they are both true. But both can be false. Perhaps a more precise definition, and some modification, of each premise will lead to a resolution of the problem. I think this is not about randomness vs objectiveness but rather randomness vs nothing being actually random. Objectivity has it's own opposite: relativity. Because of relativity we have big problems determining what's what, therefore objectivity is recommended specially when dealing with advanced physics, universal laws and such things. 1+1 will always equal 2 only if the correct rules are applied, just as the author said. Otherwise, 1+1 = 2 is not true. As a rule-based example: 1+1 = 10 if the base rule is that we deal with a binary system. To discover if there is any true randomness somewhere in the Universe may not be that easy. For example anything natural is related to Golden Ratio and/or Fibonacci, so there's nothing random in living organisms or plants (not even at DNA level). Going from DNA level and atoms to a very large scale like galaxies, we will notice that even the stars have a non-random arrangement in galaxies. So from an Universal point of view, the vote goes against randomness (note: not to be confused with chaos). That being said, what's left to do is try to generate our own synthetic randomness, just to prove that it can be done. But in this situation, we may find that this isn't easy either. In the case of computers, it's well known that numbers generated using them aren't genuinely random. Any piece of software needs some kind of unpredictable physical input to be able to generate from there. But what about humans ? Well, most of the choices they make are based on something quite pre-determined so we don't get much randomness from there. but as we trick the computer giving it physical input, we could find a way to bypass the human pre-determined concepts so we get something random out of it. Let's design a situation. We have the drawing of a cube. Any sane mature human should understand that those lines drawn in 2D are the representation of a 3D cube. 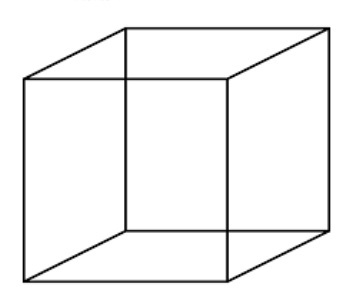 But the orientation of the cube cannot be determined from the 2D drawing, so each human would have to pick a way he thinks the cube orientation is. By choosing the orientation the humans think the cube may have, we can say that we generated a random sequence of 0s and 1s. But is it truly so ? If we do this test to thousands or more, we may find that a selection is way more preferred compared to the other. That means some other pre-determined factor (like spatial orientation capabilities, geometry knowledge, the distance between the eyes and object) influences the choice. So in order to actually have the random result we must consider all these factors when making the test. So basically, if we are able to account for everything involved, we may find a trick to generate something truly random. Otherwise...slim chances. Not the answer you're looking for? Browse other questions tagged epistemology truth causality or ask your own question. Is it possible to have evidence that something exists without having an explanation for why the thing exists?